A fun spin on this classic cocktail with a citrus twist. Pour 2 cups of rosé into an ice cube tray. Freeze overnight. For the simple syrup: In small saucepan, combine orange zest and ½ cup sugar. Using a wooden spoon, muddle until orange zest becomes fragrant. Heat over medium-low heat and add orange juice. Simmer just until sugar dissolves. Remove from heat, let cool. In a separate saucepan, combine remaining ½ cup sugar, water and orange peel. Boil for 30 minutes or until orange peel is soft. Drain, cool and reserve. Add 2-3 rosé ice cubes to a glass. Combine remaining 7½ ounces rosé, bourbon and 4 tablespoons simple syrup. Stir and pour over ice cubes. Garnish with candied orange peel. 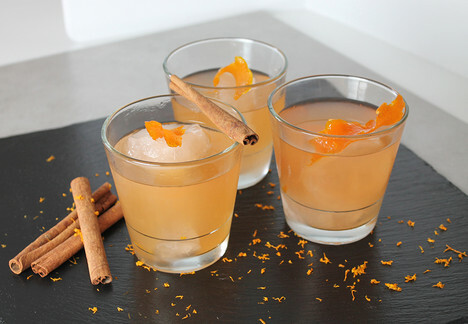 For a festive twist, add a cinnamon stick . Tip: Simple syrup and candied orange peel can be made ahead of time. Store in an airtight container in the refrigerator for up to 5 days.